Hearing loss can be inevitable for some older folks, as well as for their music blasting, phone screen-staring grandchildren. Naturally, many of those who've lost their hearing are keen on getting it back, somehow, with things like hearing aids and cochlear implants. But what if your doctor could just turn some of your own body's cells back into sound-sensing hair cells, and transplant them right back into your head? A team of scientists at Indiana University might be getting closer to that future, using pluripotent stem cells, cells from the body that can be turned back into blank slate cells. The researchers were able to use these cells to create functioning pieces of the inner ear, chock full of hair cells and neurons. 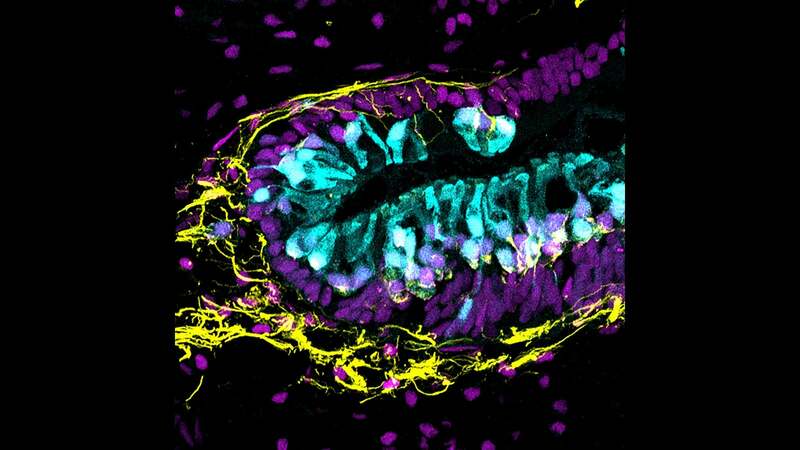 True stem cell hearing loss treatment is a long way off, but the result is, as far as they can tell, the first time anyone's created hair cells from human pluripotent stem cells. So, a step in that direction. "It's exciting," study co-authors Jeffrey Holt told Gizmodo "If we're going to use these approaches in the clinic we'll want to start with human stem cell tissue." Hearing loss can come from damage to elongated hair cells inside the ear that help with detecting sounds and relaying them to your brain. While some animals regenerate them, humans don't, and we can damage them from loud noises and ageing. Scientists have been looking for methods like stem cells and gene therapies to repair them. For their new study, the researchers started with human stem cells, arranged them in a sort of organic gel matrix like chunks of fruit in Jell-O, and tagged them with a fluorescent gene that would produce a glowing signature if they'd successfully produced certain cell types. They turned the stem cells into little pieces of inner ear by applying proteins at just the right time in a step-by-step process, and after a few weeks of tending to their cellular masses, were able to demonstrate that the little globs had developed into part of an ear. That included hair cells that both looked and acted properly, as well as neurons that send sound signals to the brain, according to results published yesterday in the journal Nature Biotechnology. "If you apply these signals at the wrong time you can potentially generate a brain instead of an inner ear," study author Karl Koehler told Gizmodo. "The real breakthrough is that we figured out the exact timing to do each one of these [protein] treatments." The researchers didn't implant the cells into a human patient or anything, but they still took a hugely important step. "The idea, to be able to one day take a tube of blood and make your hair cells and implant is really exciting. I think it's the future," Eric Topol, Founder and Director of the Scripps Translational Science Institute in California who was not involved in the study, told Gizmodo. "It's a biological remedy to hearing loss." It will take a long time to actually get to the transplanting stage, warned Holt and Koehler, and it's been slow going. Other studies have used mouse cells or have been very preliminary, said Koehler. "It's difficult to say whether or not we'll be able to use stem cell-derived cells to rebuild the inner ear." Plus, these kinds of discussions always come along with ethical concerns. The World Health Organisation suggests that over half of the world's cases of deafness are preventable. Still, there's an entire American Deaf culture and identity that could be forgotten when we do research like this. Not all deaf people want to regain their hearing, according to reporting done by The Atlantic. I reached out to the National Association of the Deaf whose bioethics committee is looking at the paper, but does not have a response at this time. Even if treatments like this are a long way off, growing these cells could be important for research, says Holt — mainly to continue doing experiments. "It's hard to get human inner ear hair cells otherwise. We can't get them from the patients and most people don't want to give up an ear for our experiments."